Last year Country Life magazine revealed an astonishing new image of William Shakespeare, the first and only known demonstrably authentic portrait of the world’s greatest writer made in his lifetime. Until now, the only authentic likenesses of William Shakespeare were found in the First Folio and his monument at Holy Trinity Church, Stratford, both created posthumously. The new image shows Shakespeare with a film star’s good looks, in the company of Lord Burghley, the most powerful man in the land. Botanist and historian Mark Griffiths reveals in this week’s issue of Country Life magazine, out today (May 20), how he cracked a many-layered Tudor code and revealed the living face of Shakespeare for the first time, on the title page of The Herball by John Gerard, a 16th century book on plants, 400 years after it was first published. 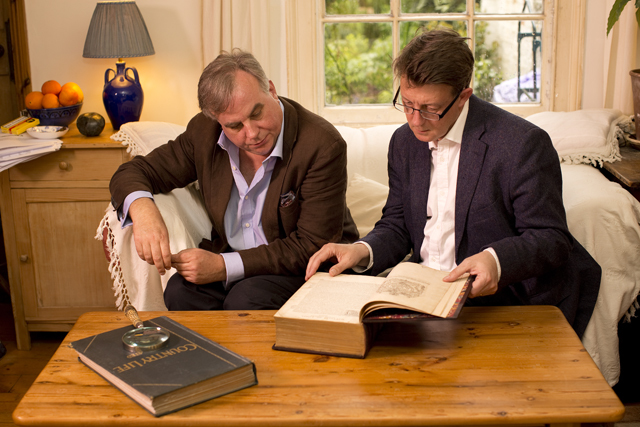 From left to right: Mark Griffiths and Mark Hedges study a first edition of The Herball by John Gerard. As a result of this discovery, Country Life will reveal a new play by Shakespeare and how his career was launched in the May 27 issue of Country Life.